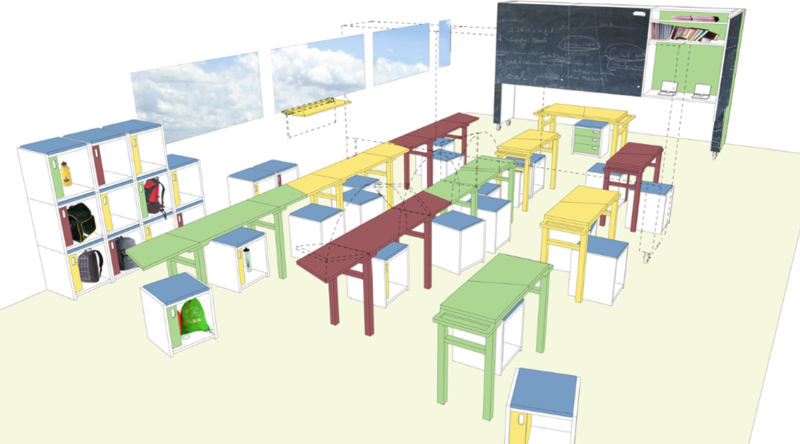 Working in collaboration with a small team of designers/architects, proposals for a low cost, flexible and transportable classroom for Open Architecture Network’s “Classroom of the Future” competition. Lady Lusha School is located on the 4th floor of a rented building in the outskirts of Nairobi, Kenya. It consists of four classrooms (accommodating four Forms, ages 13-19), a dormitory room, an office and a small kitchen. The current spaces are too small to accommodate the 70 and growing number of students. These cramped classroom conditions are made worse by poor furniture and lack of storage space. The landlord does not allow his tenants to make direct changes to the property. All our designs have minimal impact on the current space, which means that uprooting to a new site will be easy, immediately transforming any new room into a functioning, secure and inspirational space. A mobile structure, accommodates the secure storage of textbooks, laptops etc. This unit can be wheeled away from the wall, over the desks and seats, to create a partition, allowing dual use within the same space. Folding desks are proposed for flexibility of use and ease of transportation. Robust seats incorporate bag storage as well as a lockable cupboard and when necessary can be stacked, forming a locker wall.